He participated in the national liberation movement. Persecuted by the Turks, he moved into Plovdiv. About the year 1868, he became teacher at the St.Trinity school. 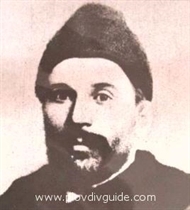 He was an active participant in the activities of the local revolutionary committee founded by Vassil Levski (1869), and he was chosen as his chairman. He participated in the 1876 April Uprising. After the Liberation of 1878, he was the Chairman of the secret committee Unity in Plovdiv, and one of the leading organisers of the gymnastics societies of East Roumelia.